Compare tickest for the 2020 Chinese Grand Prix in Shanghai. 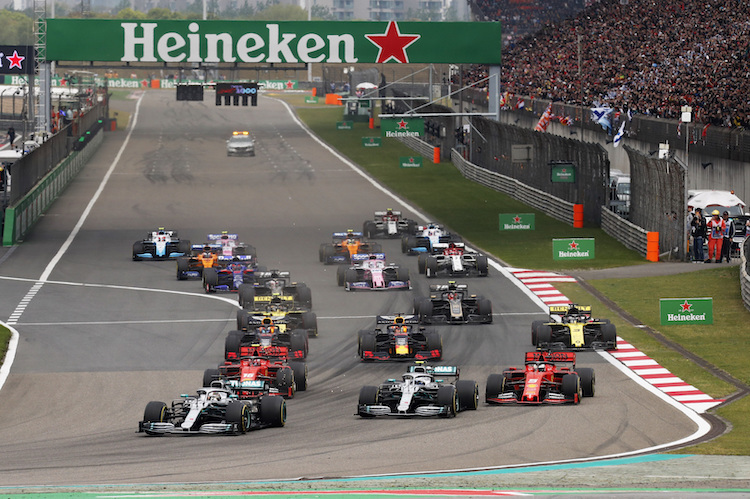 Compare tickest for the 2020 Chinese Grand Prix in Shanghai. Tickets for the 15th Chinese F1 Grand Prix at Shanghai international Circuit are not on sale yet. The Chinese Grand Prix has been one of the cheapest grand prix’s on the calendar in the past. As soon as tickets are released we will update this page. There are four general admission zones at Shanghai.. This is the main grandstand and is situated at the start/finish line. It is a covered grandstand with viewing screens so that you don’t miss any of the action. ‘Main A Low’ starts at approximately £173 for a weekend ticket. ‘Main A High’ starts at approximately £220 for a weekend ticket. ‘Main A Platinum’ starts at approximately £326 for a weekend ticket. This is also a covered grandstand which is placed at the end of the main straight just before the hairpin turn. This grandstand is situated just after the last turn as they zoom past the grandstand and up to the finish line. It’s only possible to reserve a grandstand seat on the Saturday and Sunday. Friday is a free seating system and spectators can sit in any available grandstand. Children must be under 16 years old by the April 2019. All children will require a ticket to access the circuit. It’s possible to buy a family ticket for Main A+ High, Main A+ Low, K and H grandstands. Each Family ticket includes one adult seat and one child seat. Additional child tickets can be purchased. Child seats in other grandstands are sold at the full adult ticket price. There is no Pit Walk information for this event. The Grandstand Club is an alternative to the paddock club. The hospitality suite is located on the third floor in the Main A Grandstand. The club suites over look the start/finish straight and pit lane/garages. As well as enjoying great views of the race you can also see the podium. Please contact us if you would like further information on hospitality packages for the Shanghai International circuit. Provisional Date: Please note, this event has a provisional date and the official date will be released with the 2020 calendar. Hi Russell, Excellent have you checked out our ticket resellers? Hi there, can I ask where do you look for the ticket re-seller for the chinese Grand Prix. Our normal resellers BookF1 and GooTickets. I’m in interested in 1 ticket general admission. Hi Bogosi, It looks like tickets are sold out for 2019. Any idea where I could find few tickets for Chinese gp? Hi Teemu, It looks like tickets for 2019 are now sold out acceptd for Hospitality tickets. I cant find any tickets anywhere for the Chinese GP. They don’t even seem to be listed in Viagogo. Any other suggestions on where I could find 1 ticket? Hi Andrew, Sorry me neither, looks like they are sold out for 2019.